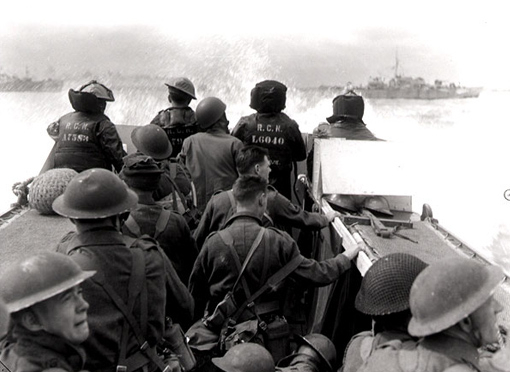 ” In Dennis Sullivan’s photograph above, a landing craft from HMCS Prince Henry carries Canadian troops toward Juno Beach in the early hours of D-Day. Many years ago, I spoke to someone who’d been aboard the Prince Henry’s sister ship, HMCS Prince David, who talked about the subtly different dynamic among the guys on those landing craft. The Royal Canadian Navy men at the front are concerned to make their rendezvous on time: They’re in the middle of the mission, and they want to complete it. The infantrymen behind them are waiting for theirs to start. As the Prince Henry recedes behind them, they know they’re leaving the best-laid plans, and that what awaits them on shore is about to go agley. A lot went wrong, but more went right – or was made right. A few hours before the Canadians aboard the Prince Henry climbed into that landing craft, 181 men in six Horsa gliders took off from RAF Tarrant Rushton in Dorset to take two bridges over the river Orne and hold them until reinforcements arrived. Their job was to prevent the Germans using the bridges to attack troops landing on Sword Beach. At lunchtime, Lord Lovat and his commandos arrived at the Bénouville Bridge, much to the relief of the 7th Parachute Battalion’s commanding officer, Major Pine-Coffin. That was his real name, and an amusing one back in Blighty: simple pine coffins are what soldiers get buried in. It wasn’t quite so funny in Normandy, where a lot of pine coffins would be needed by the end of the day. Lord Lovat, Chief of the Clan Fraser, apologized to Pine-Coffin for missing the rendezvous time: “Sorry, I’m a few minutes late,” he said, after a bloody firefight to take Sword Beach.